I have some personal news I find rather exciting. This month marks two years since my cancer diagnosis. Can you believe it has been that long! Well, I am 1.5 years cancer free at the moment. I hope I am not getting too cocky posting that! I still think about all the great people I met during treatment and of course I have gnarly scars to remind me everyday that life is a precious thing. Well, as I got to thinking about this today I decided that my kids and I are going to do something for children affected by cancer. I am directing my efforts at kids so I can involve my own and get them excited about it. But of course adults are also victims of this horrible disease. So I will also be volunteering to provide “Chemo Rides” for those who may be alone and need a lift to their weekly chemo sessions. 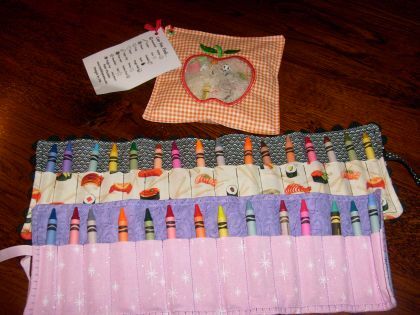 For the children I was thinking about sewing crayon rolls and then giving them to children at The James, a cancer hospital in Columbus, Ohio. I need to speak with them about it but I soooo hope they will agree to let us do this. And oooh, if I could get soy crayons at wholesale rates…hmmmm. Anyway that will be my little project to work on. I am just looking for a more reliable sewing machine and I will be set. My good friend Carrie at Natural Moms Talk Radio has a great post up about eating cooler in the summer. Cooking in the summer and heating up an already hot kitchen presents a problem for many folk but her post has lots of great suggestions. No Impact Man is talking about how religion and faith in God can’t be used as an excuse for being environmentally lax. Awesome post! Re-purposing marbles to make lovely marble suncatchers. Which reminds me that I am now using Flickr to document our family adventures. Check it out if you have a moment! It is yard sale season!!! I have been yard sale hopping 3 weekends in a row now and have scored some great things. Just today I found 3 handmade costumes for a little girl. They were worn in school plays and are so adorable. Now my daughter can be a renaissance lady, a pilgrim, and wear an Asian Kimono. My son also got a pair of roller blades for a $1….they just need new wheels. It got me thinking about some of my posts here about yards sales. See budget and style on a cheapskate budget. Well, I am off to enjoy my weekend! See you later!